“Hunter’s Arsenal” is 1/6 scale weapons collection wielded by the player character, HUNTER, in the mega hit action RPG for PlayStation®4, “Bloodborne,” enthusing game freaks around the world. The Whirligig Saw is newly added weapon to the downloadable contents, “The Old Hunters,” and very popular for the insane appearance like torture device and powerful performance. All the beautiful carving and detailed mechanical structure on the vicious saw are recreated as a figure under the thorough supervision of the design team of FromSoftware. Both the pre- and post-transformed condition can be recreated. It can be attached to HUNTER 1/6 scale statue. 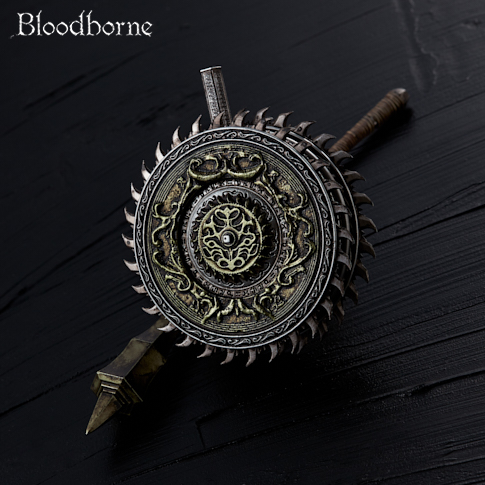 Moreover, displaying it on the optional accessory, “Collection Board,” collectors can enjoy the world of Bloodborne deeply. ⓒ2012-2019 Gecco Corp. All Right Reserved.